Hello everyone! I just came around to update you a little bit on what has been or will be going on. I'm enjoying the holidays at their fullest, mostly by spending time with people I love the most. At the moment I'm back at my place, spending the night at my own bed after almost 14 days of being around places but I'm already heading to the coast tomorrow again. Another news would be, that after I'm done with holidays, I'm bringing this blog to another level, meaning I have a new photographer, which means more and what is most important better photos. Well till than, I wish you all to have as amazing time as I have! hip hip hura, komi čakam da začneš z novimi fotkami :) bo žiga ta fotograf? Cool is an understatement. 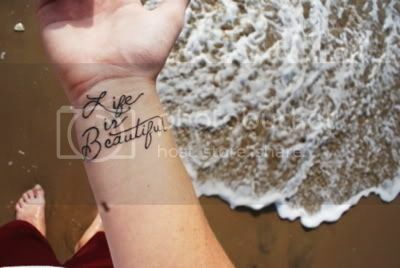 The message on the tattoo is so deep, yet so simple to enjoy. such a cool tat. enjoy your vacation.